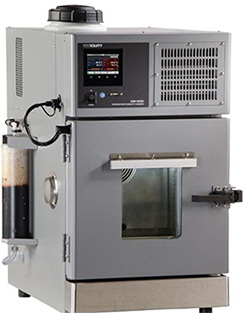 MOORPARK, CA, November 13, 2017 -- TestEquity, a premier value-added distributor of electronic test equipment solutions and eMRO tools and supplies, today announced that a new compact temperature/humidity chamber has been added to its growing line of environmental test chambers, designed and manufactured at the company’s California headquarters. "This new chamber allows engineers to perform humidity tests right at their bench instead of going to an environmental test lab or tying up a larger chamber," said Peter Kesselman, Vice President of Product Development at TestEquity. "Since it is completely self-contained and does not require an external water source or drain, it can be used anywhere without the need for facility changes". The benchtop version of the Model 101H Temperature/Humidity Chamber fits easily on a test bench while the floor-standing version requires minimal floor space. It is designed for a wide range of device characterization and tests, including mobile phones and tablets, passive and active components, and small PC boards. The Model 101H has a 1.1 Cu Ft interior workspace and is powered by a standard 120V, 15A outlet. It can simulate humidity from 10% to 95% within the range of 10°C to 85°C, limited by a 6°C dew point. Lower dew point conditions can be achieved with GN2 Purge or Dry Air Purge options. It has a temperature range of -18°C to 130°C in temperature-only mode. A built-in water reservoir and recirculation/filter system eliminates the need for plumbing or drain lines, making this a truly plug-and-play chamber. Humidity is generated by a patent-pending Mass-Transfer Vapor Generator. This provides better humidity stability throughout the entire operating range compared to steam generators and is accomplished without an exposed water bath. With the F4T Touch-Screen Controller, the new chamber is exceptionally easy and intuitive to use. Ethernet and RS-232 communications are standard. A USB host port lets users transfer data log files, profile configuration files, and controller configuration files via a flash drive. GPIB is available as an option. Additional features include a viewing window with exterior LED lighting and 3" access ports on the left and right side. The Model 101H-B benchtop version is convertible to a 101H-F floor-standing version by the simple addition of a caster base which bolts to the chamber. TestEquity makes the purchase of an environmental chamber easy by including the most frequently requested options in a standard unit for one price, with fast delivery from stock. All standard models are available for sale, rental or lease. TestEquity is a leading value-added provider of Test & Measurement Solutions, eMRO Tools and Supplies. TestEquity also designs and manufactures its own line of Environmental Test Chambers at its headquarters in Moorpark, California. As a customer-centric business with highly trained and experienced product specialists across the United States, Canada, and Mexico, TestEquity helps businesses by providing the industry's top brands together with innovative products and unparalleled customer service.